Homeowners, weekend warriors, and masonry workers are exposed to severe second and third degree burns from contact with wet ready mixed concrete. Wet concrete can cause serious chemical burns to the skin of the people working with it. The danger is hidden because the burns are caused by the caustic nature of a chemical, calcium hydroxide, in the water or juice that is part of the wet concrete. It doesn’t feel like anything when it gets on the skin. By the time the user feels a tingling on their skin, they have suffered second and third degree burns, typically on their legs and knees, and sometimes their feet. This danger is unknown to amateurs, homeowners, and weekend warriors. It is little known and poorly understood among professional masons. Every concrete burn case I have seen involves a belief on the part of the victim of the burn that there was something “wrong” with the concrete. 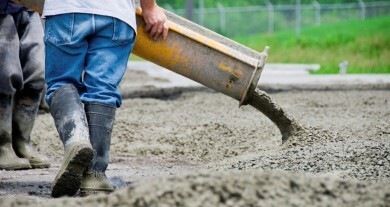 Concrete is made up of sand, stone, Portland cement, and water. These all react together to form wet concrete. The juice contains calcium hydroxide, a highly caustic chemical. If this soaks into the clothing of the worker, and the clothing remains against the skin, usually the legs, by the time the worker is aware that something is wrong they have suffered nasty burns. These injuries happen to homeowners and their friends who are building a patio or driveway on the weekend. They happen to longtime masons working on commercial or residential products. The burns require immediate medical attention, and often require skin grafting to replace the damaged skin and tissue. For questions about this danger or these injuries, do not hesitate to contact us.